Ford has contributed greatly to the world of automatic transmissions. Are you interested in learning about the history of Ford automatic transmissions? If so, you’ve come to the right place. In the sections below, we’ll go over an accurate and brief history of how Ford automatic transmissions evolved into what they are today. The A4LD is a very early automatic over drive transmission built by the Ford Motor Company. It is really nothing more than an earlier C3 three speed transmission with an overdrive gear added. It is a fairly weak transmission that was used only behind four and six cylinder engines. It was eventually replaced by the 4R44E automatic transmission that featured a fully electronic valve body, something the A4LD lacked. The A4LD first went into production in 1985, and remained a viable optional transmission through the end of the 2002 model year. The A4LD was used widely throughout the Ford brands of the time (including Mazda) and could be found in vehicles like the Ford Bronco II (smaller of the two Bronco models), the Ford Thunderbird, the Ford Mustang four cylinder models only), the Ford Aerostar minivan and the Ford Explorer. It could also be found in the Ford Ranger. Planning On Taking Your F150 Raptor Off Road? Carry A Spare 6R80 Transmission! The 6R80 is a six speed automatic transmission built under license by the Ford Motor Company. The very popular Ford AOD transmission is the predecessor to the 6R80. The 6R80 transmission comes from a family of transmissions that include the 6R60 and the 6R75. All three transmissions are based on the ZF 6HP26 transmission. The 6R80 is a fully electronic transmission and uses more than six electrical solenoids to shift the transmission and control the lockup torque converter. It was designed for use in vehicles with a front mounted motor and rear wheel drive. The 6R80 transmission was first put into use in the 2009 model year and remains in production today. This transmission was widely used throughout the Ford lineup, and could be found in vehicles like the Ford Mustang, the Ford Ranger, the Ford Expedition and the Ford Explorer. It could also be found in the F150 Raptor pickup truck. To purchase the right automatic transmission, you need to ensure that each individual part is working properly. Like most things in life, purchasing the right automatic transmission requires that you do your due diligence beforehand. This will ensure that you not only choose the right automatic transmission for your vehicle, but also the one that best suits your driving style and taste. Let’s take a look at the various elements of automatic transmissions, as well as how they can differ from model to model. The Ford F150 family of vehicles has been, and continues to be one of the best-selling vehicles in North America. The tenth generation of this vehicle, built between 1997 and 2004, was a top seller for Ford. The F150 was available in a number of special editions during this time period, including the Lariat, the King Ranch, the Lightening and the Harley Davidson edition. The list of options for the F150 is almost endless. You can choose from between three bed lengths, a number of cab configurations (regular, Extended, Crew and Supercrew) and your choice of two wheel drive or four wheel drive. Engine options included a base V6 engine up to a supercharged 5.4 liter motor found in both the Lightning and Harley Davidson editions. Interior could be ordered completely stripped down with rubber flooring, all the way up to the high end luxury interiors found in the King Ranch editions. 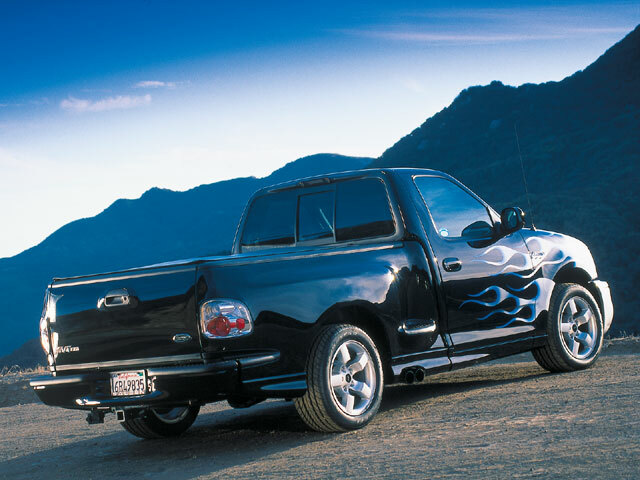 Millions of tenth generation F150 pickup trucks were built during this generation’s production run. The AOD is Ford very first four speed automatic transmission. The AOD stands for Automatic Overdrive. The AOD transmission is heavily based on the earlier Ford FMX transmission. In addition to replacing the FMX, it also replaced the C4 and C5 light-duty three-speed transmission. The AOD first went into production in 1980 and was eventual phased out of production in 1993, at which point it was replaced by the AODE, then the 4R70W and finally the 4R75W. The AOD was equipped with a weak first gear ratio (at least for an overdrive transmission) of on 2.40:1. On the other end of the spectrum, it came with a very sweet overdrive ratio of 0.67:1 (33% over-driven). The AOD transmission could be found in a very wide range of Ford branded vehicles, including the Thunderbird, the Ford LTD, the Bronco, the Mustang, the Ford F-series pickup trucks and the Ford Crown Victoria. It could also be found in the Ford Econoline. Domestic vs. Imported Vehicles: Which Offer Better Automatic Transmissions? Find out if domestic transmissions are really better than imported ones and why. It’s the all-too-common debate that you hear among vehicle enthusiasts, “Are domestic automatic transmissions better than imported ones? Or vice versa?” In the following sections, we’re going to help resolve this debate once and for all by showing you the advantages and disadvantages of each kind. That way, you can make a better decision as to which type of automatic transmission is right for you.